This prose specification is one component of a Work Product whose components are listed in http://docs.oasis-open.org/cti/cybox/v2.1.1/csprd01/cybox-v2.1.1-csprd01-additional-artifacts.html. · STIX™ Version 1.2.1. Edited by Sean Barnum, Desiree Beck, Aharon Chernin, and Rich Piazza. 05 May 2016. OASIS Committee Specification 01. http://docs.oasis-open.org/cti/stix/v1.2.1/cs01/part1-overview/stix-v1.2.1-cs01-part1-overview.html. The Cyber Observable Expression (CybOX) is a standardized language for encoding and communicating high-fidelity information about cyber observables, whether dynamic events or stateful measures that are observable in the operational cyber domain. By specifying a common structured schematic mechanism for these cyber observables, the intent is to enable the potential for detailed automatable sharing, mapping, detection and analysis heuristics. This document serves as an overview of those specifications and defines how they are used within the broader CybOX framework. CybOX™ Version 2.1.1. Part 01: Overview. Edited by Trey Darley, Ivan Kirillov, Rich Piazza, and Desiree Beck. 20 June 2016. OASIS Committee Specification Draft 01 / Public Review Draft 01. http://docs.oasis-open.org/cti/cybox/v2.1.1/csprd01/part01-overview/cybox-v2.1.1-csprd01-part01-overview.html. Latest version: http://docs.oasis-open.org/cti/cybox/v2.1.1/part01-overview/cybox-v2.1.1-part01-overview.html. The Cyber Observable Expression (CybOX™) provides a common structure for representing cyber observables across and among the operational areas of enterprise cyber security. CybOX improves the consistency, efficiency, and interoperability of deployed tools and processes, and it increases overall situational awareness by enabling the potential for detailed automatable sharing, mapping, detection, and analysis heuristics. This CybOX specification overview document serves as a unifying document for the full set of CybOX specification documents. In Section 0, we discuss additional specification documents, in Section 1.2, we provide document conventions, and in Section 1.3, we provide terminology. References are given in Sections 1.4 and 1.5. In Section 2 we discusses the modularity of CybOX, and summarizes the relationship of CybOX to other languages. In section 3, we discuss conventions common across all of the data models. Conformance information is also provided in Section 4. The CybOX specification consists of a formal UML model and a set of textual specification documents that explain the UML model. Specification documents have been written for each of the individual data models that compose the full CybOX UML model. CybOX has a modular design comprising two fundamental data models and a collection of Object data models. The fundamental data models – CybOX Core and CybOX Common – provide essential CybOX structure and functionality. The CybOX Objects, defined in individual data models, are precise characterizations of particular types of observable cyber entities (e.g., HTTP session, Windows registry key, DNS query). Additionally, the full CybOX data model includes various extension data models and a set of default controlled vocabularies. Use of the CybOX Core and Common data models is required; however, use of the CybOX Object data models is purely optional: users select and use only those Objects and corresponding data models that are needed. Importing the entire CybOX suite of data models is not necessary. · Capitalization is used for CybOX high level concepts, which are defined in CybOX™ Version 2.1.1 Part 1: Overview. Note that all high level concepts have a corresponding UML object. For example, the Action high level concept is associated with a UML class named, ActionType. · The ‘italic’ font (with single quotes) is used for noting actual, explicit values for CybOX Language properties. The italic font (without quotes) is used for noting example values. Each CybOX data model is captured in a different UML package (e.g., Core package) where the packages together compose the full CybOX UML model. To refer to a particular class of a specific package, we use the format package_prefix:class, where package_prefix corresponds to the appropriate UML package. This specification makes use of UML diagrams to visually depict relationships between CybOX Language constructs. Note that the diagrams have been extracted directly from the full UML model for CybOX; they have not been constructed purely for inclusion in the specification documents. Typically, diagrams are included for the primary class of a data model, and for any other class where the visualization of its relationships between other classes would be useful. This implies that there will be very few diagrams for classes whose only properties are either a data type or a class from the CybOX Common data model. Other diagrams that are included correspond to classes that specialize a superclass and abstract or generalized classes that are extended by one or more subclasses. In UML diagrams, classes are often presented with their attributes elided, to avoid clutter. A class presented with an empty section at the bottom of the icon indicates that there are no attributes other than those that are visualized using associations. Generally, a class property can be shown in a UML diagram as either an attribute or an association (i.e., the distinction between attributes and associations is somewhat subjective). In order to make the size of UML diagrams in the specifications manageable, we have chosen to capture most properties as attributes and to capture only higher level properties as associations, especially in the main top-level component diagrams. In particular, we will always capture properties of UML data types as attributes. Diagram icons are used in a UML diagram to indicate whether a shape is a class, enumeration, or a data type, and decorative icons are used to indicate whether an element is an attribute of a class or an enumeration literal. In addition, two different arrow styles indicate either a directed association relationship (regular arrowhead) or a generalization relationship (triangle-shaped arrowhead). The icons and arrow styles we use are shown and described in Table 1‑1. The CybOX Core data model defines the four main classes: Action, Event, Observable and Object which corresponds to the primary structure characterized in CybOX. Please see CybOX™ Version 2.1.1 Part 3: Core for complete information on the CybOX Core data model. Each release of the CybOX language includes a particular set of Objects that are part of the release. There are eighty-eight different Object data models in CybOX 2.1.1. They cover a varied collection of artifacts that are pertinent to the cyber threat domain. The data model for each of these Objects is defined by its own UML package that describes the context-specific classes and properties that comprise the Object. As stated in the introduction, the use of any particular CybOX Object data models is purely optional: users select and use only those Objects and corresponding data models that are needed. The grouping of Objects below is for expository purposes only. It does not suggest or imply the need to use of any particular Object data model. The Object data models are split into three major categories: Host-based artifacts, Network-based artifacts, and the catch-all miscellaneous artifacts. Among the Host-based artifacts, there are many data models that are extensions of others in order to define properties specific to the Windows or Unix operating systems. Some of the Object data models are very simple (e.g. DNS_Cache), containing one or two UML classes or data types; others are quite complex, encompassing many UML classes (e.g., PDF_File). Each individual Object data model has a main toplevel class, which is usually named after the UML package name (e.g., the main class in the PDF File Object data model is PDFFileObjectType). The Event and Action data models are designed to support modular expression of any event made up of one or more actions with the ability to relate actions to one another and to relate actions to relevant objects. The Action data model allows expression of the nature of the action, any relevant arguments and relationships to any relevant objects including the nature of the relationship and any specific effects the action has on the object. 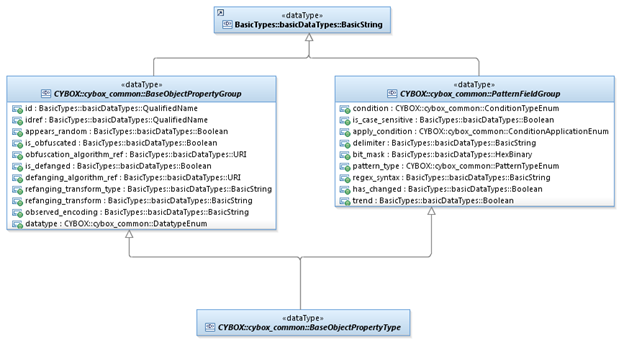 The CybOX Common data model defines object classes that are shared across the various CybOX data models. At a high level, the CybOX Common data model provides object property classes, content aggregation classes, shared classes, and a pattern class for permitting complex (i.e. regular-expression based) specifications. Please see CybOX™ Version 2.1.1 Part 2: Common for complete information on the CybOX Common data model. The Object Property data model in CybOX is sophisticated, enabling the description of complex Observables. Observables can be made up of Objects or Events. In this section, we will concentrate on the Object aspect of an Observable. Objects have two main properties, Properties and Related_Objects. This is shown in Figure 2‑1. The Object data models, described in Section 2.2, are not extensions of ObjectType, but instead are used in an ObjectType class instance via the Properties property. Accordingly, they are extensions of ObjectPropertiesType, an abstract class. Notice that only a single toplevel instance from one of the Object data models is specified in the Properties property. Instances of other Objects can be referred to via the Related_Objects property. · Other toplevel classes from other Object domain models. The following figures provide an example. The EmailMessageObjectType class extends the ObjectPropertiesType, and therefore can be used in the ObjectType class (Figure 2‑2). The properties of EmailMessageObjectType use other classes from the same UML package as well as StringObjectPropertyType, an extension of ObjectPropertyType. Expanding the detail of the EmailHeaderType class (Figure 2‑3), one can see that in addition to data type-based properties extended from the ObjectPropertyType class (e.g., IntegerObjectPropertyType) it also makes use of a class from the domain model of another Object (AddressObjectType). Notice that AddressObjectType contains properties that use data types from the BasicTypes package (see Section 2.7). Use of UML data types that extend from BaseObjectPropertyType enables a producer of content to include much more detail about the value of an Object’s property (Figure 2‑4). BaseObjectPropertyType data type extends from BaseObjectPropertyGroup, which is an abstract data type that contains the auxiliary metadata properties associated with the main property value being represented. For example, when using StringObjectPropertyType to describe the File_Name property of a File Object, one might want to include that the observed encoding of the string is “windows-1251”. In addition, the BaseObjectPropertyType data type also inherits from PatternFieldGroup data type. This data type incorporates pattern matching capabilities to all specializations of BaseObjectPropertyType. An example of using properties from PatternFieldGroup would be to use a StringObjectPropertyType to specify that the File Object’s File_Extension property satisfied the condition: not equal to “exe”. Accordingly, it follows that properties from BaseObjectPropertyGroup are used only when specifying an actual observation and properties from PatternFieldGroup are used only when specifying an observable pattern. A primary design principle of CybOX is to avoid duplicating data models that already exist for capturing cyber threat information. Therefore, CybOX leverages a number of other structured languages and identifiers through the use of default extensions. More precisely, the CybOX Default Extensions data model provides loose-coupling mechanisms and default extensions for leveraging constituent data models such as the Common Platform Enumeration [CPE] and OASIS Customer Information Quality model [CIQ]. Please see CybOX™ Version 2.1.1 Part 4: Default Extensions for complete information on the CybOX Default Extensions data model. For some properties captured in CybOX, a content creator may choose to constrain the set of possible values by referencing an externally-defined vocabulary or by leveraging a default vocabulary class defined within CybOX. Alternatively, the content creator may use an arbitrary value without specifying any vocabulary. Please see CybOX™ Version 2.1.1 Part 5: Vocabularies for more information about the default vocabularies defined in CybOX. Although four of the requisite primitive data types (Boolean, Integer, String, UnlimitedNatural) are defined in UML, the need for a broader set in CybOX drove the decision to define a complete set of basic data types in a separate, stand-alone UML package (the Basic Data Types data model). We explicitly define the data types in the Basic Data Types data model in Sections 2.7.1 and 2.7.2. Note, that the use of UML data types from the Basic Data Types data model (e.g., BasicString, Boolean) is not the same as using UML data types defined as specializations of BaseObjectPropertyType (e.g., StringObjectPropertyType, HexBinaryObjectPropertyType, etc.). The latter data types permits the use of properties from BaseObjectPropertyGroup and PatternFieldGroup, which allow for a much richer characterization of cyber observables. Also, it’s worth noting that not all data types defined in the Basic Data Types data model are used in CybOX. The Decimal data type is a sequence of decimal digits, with perhaps an intervening decimal point, “.”. The number of digits on either side of the decimal point is finite, but unbounded. Often used to express currency amounts. The data types in Table 2‑2 correspond to strings that have semantics associated with them. Because of this, they usually are restricted to a certain pattern, defined via a regular expression, and/or more formally defined in a standardization document. The following general information and conventions are used to define the individual data models in CybOX™ Version 2.1.1 Part 6: UML Model. It should be noted that the CybOX data models actually evolved as XML schemas, and as a consequence, our UML model follows some conventions so as to be compatible with the preexisting XML implementation. However, we have abstracted away from the XML implementation as much as possible. Each CybOX data model is captured in a different UML package (e.g., Core package, File_Object package, etc.). To refer to a particular class of a specific package, we use the format package_prefix:class, where package_prefix corresponds to the appropriate UML package. Table 3‑1 lists the basic packages used throughout the CybOX data model specification documents, along with the prefix notation and an example. Descriptions of the packages are provided in Section 2. The CybOX Core data model defines the main classes of the CybOX data model, such as ActionType, EventType, ObservableType and ObjectType. The CybOX Common data model defines classes that are shared across the various CybOX data models. The CybOX default vocabularies define the classes for default controlled vocabularies used within CybOX. The Basic Data Types data model defines the types used within CybOX. The UML classes, enumerations, and properties defined in CybOX follow the particular naming conventions outlined in Table 3‑2. CamelCase or if the words are acronyms, all capitalized with underscores between words. Optional identifiers (IDs) can be assigned to several CybOX constructs so that the constructs can be unambiguously referenced. Technically, the decision to specify an ID on a given construct is optional based on the specifics of the usage context. As a general rule, specifying IDs on particular instances of constructs enables clear referencing, relating, and pivoting. CybOX™ Version 2.1.1 leverages several other externally-defined data models that are relevant to the cyber threat domain. A listing of these other data models is given below. Please see CybOX™ Version 2.2.1 Part 4: Default Extensions for further information on all of the externally-defined data models CybOX leverages by default (with the exception of CybOX, for which a different reference is given in Section Error! Reference source not found.). The OASIS Customer Information Quality (CIQ) Version 3.0 is a set of XML specifications for representing characteristic information about individuals and organizations [CIQ]. By extending the CybOX Common AddressAbstractType and IdentityType classes, CybOX™ Version 2.2.1 leverages CIQ Version 3.0 to capture geographic address information and identity information associated with Threat Actors, victims, and sources of information. CPE is a structured naming scheme for information technology systems, software, and packages. Based upon the generic syntax for Uniform Resource Identifiers (URI), CPE includes a formal name format, a method for checking names against a system, and a description format for binding text and tests to a name. An XSD schema for CPE version 2.3 can be found at [CPE]. Implementations have discretion over which parts (components, properties, extensions, controlled vocabularies, etc.) of CybOX they implement (e.g., Observable/Object). Conformant implementations must conform to all normative structural specifications of the UML model or additional normative statements within this document that apply to the portions of CybOX they implement (e.g., Implementers of the entire Observable class must conform to all normative structural specifications of the UML model regarding the Observable class or additional normative statements contained in the document that describes the Observable class). Conformant implementations are free to ignore normative structural specifications of the UML model or additional normative statements within this document that do not apply to the portions of CybOX they implement (e.g., Non-implementers of any particular properties of the Observable class are free to ignore all normative structural specifications of the UML model regarding those properties of the Observable class or additional normative statements contained in the document that describes the Observable class). The conformance section of this document is intentionally broad and attempts to reiterate what already exists in this document. The authors would also like to thank the larger CybOX Community for its input and help in reviewing this document.